Supersymmetry (SUSY) is one of the most attractive theories extending the Standard Model of particle physics. SUSY would provide a solution to several of the Standard Model's unanswered questions, by more than doubling the number of elementary particles, giving each fermion a bosonic partner and vice versa. In many SUSY models the lightest supersymmetric particle (LSP) constitutes dark matter. Certain (dubbed "natural") SUSY models may explain the relatively light mass of the Higgs boson. Natural SUSY requires the mass of the supersymmetric partner of the top quark – the top squark – to be less than about a thousand times the mass of a proton. Hunting for the top squark has been a challenge, as top squark events are rare and hidden in the overwhelming Standard Model background. Only by gathering significant amounts of data from LHC proton–proton collisions can ATLAS physicists overcome these odds. 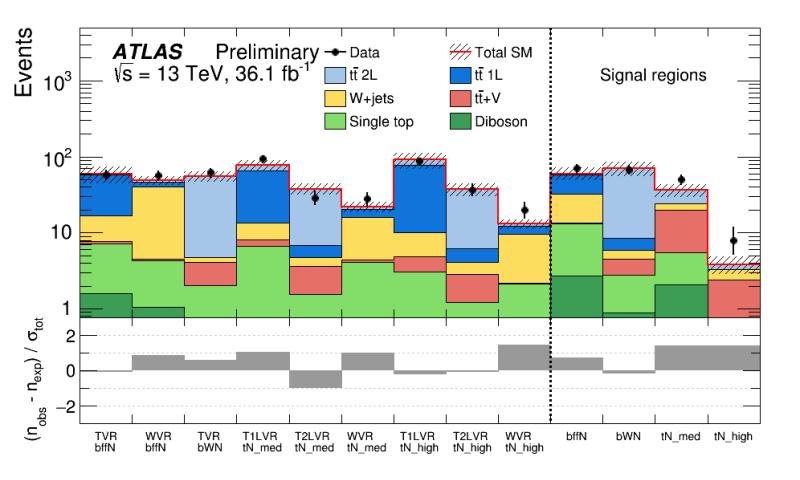 In March 2017, the ATLAS Collaboration presented new results on the search for top squark pair production in a fully hadronic ("0-lepton") channel using the entire available data sample taken at 13 TeV collision energy in 2015 and 2016. 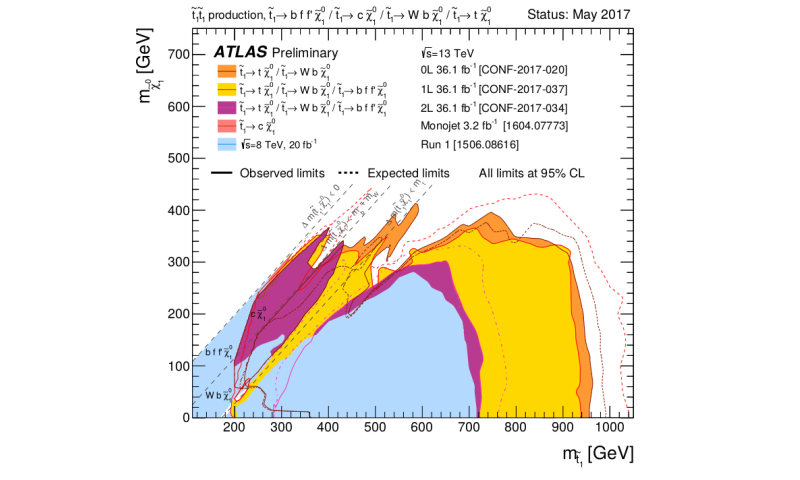 In new ATLAS results presented at the LHCP 2017 conference, the search for top squarks has been extended to the "1-lepton" channel. Different top squark decays have been studied all resulting in the LSP and additional Standard Model particles. Events from the "1-lepton" channel are characterised by multiple jets (a collimated spray of particles), one charged electron or muon (a sort of heavy electron), and some "missing energy" from the LSP that interacts weakly only and is thus not directly visible in the ATLAS detector. This search comes with challenges: if the mass difference of the top squark and the light SUSY particle is close to the mass of the top quark, the event topology of top squark pair events would be very similar to that of top quark pair events. In previous searches in the "1-lepton" channel, the sensitivity to this difference was found to be poor. In this new result, however, machine learning algorithms like Boosted Decision Trees, have been used in this region, leading to substantially improved sensitivity. The latest ATLAS result (Figure 1) shows no compelling sign of the top squark. The data can be used to constrain SUSY models thus increasing our knowledge of this theory. Exclusion limits on top squark pair production in the top squark and LSP mass plane are summarised in Figure 2 for a simplified SUSY model where the top squark decays directly into the LSP and some Standard Model particles. While the constraints are stringent there is still room for top squarks to hide. Why are graphs so often displayed in online science articles so that the horizontal scale is cut off? It happens with both firefox and chrome. Here at least when I click for 'enlarge' I get the scale. Spooky axis at a distance?